Swanswater was open all week despite overnight temperatures at the beginning of the week dropping to around -9oC. As the week went on and both air and water temperatures rose, the fishing improved and there was some great sport to be had. At the start of the week, the water temperature was only 2oC but it rose to 4oC by Saturday. For much of the week the area round the back was frozen but the main area was completely ice-free. The fish were in the channel in front of the island and a useful tactic was to fish as near to the ice as possible. This tactic also worked very well on the Millpond with many fish being caught near the edge of the ice. Once the area behind the islands on Swanswater thawed a good number of fish were to be found there. The water is exceptionally clear and, at times, fish could be seen chasing flies. 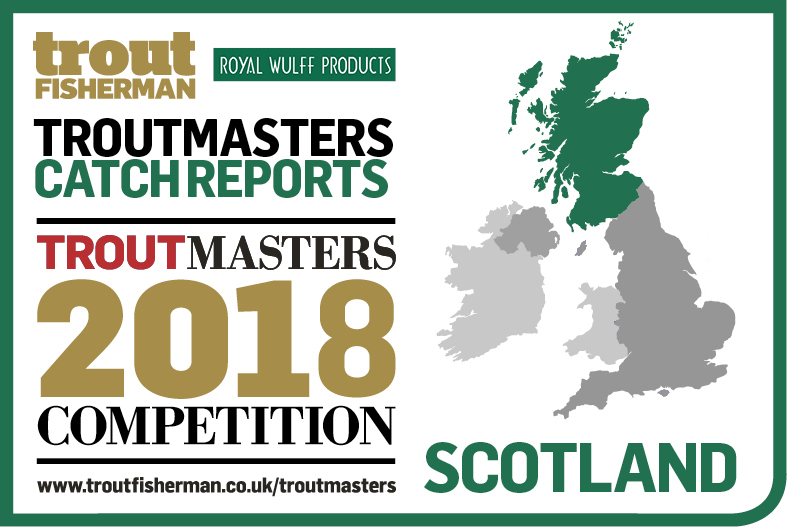 Most fish were taken on small lures or nymphs with favourite patterns being Cat’s Whisker, Dancer, Humungus, Silver Sparkle, Bloodworm, Hare’s Ear, Diawl Bach and Buzzer. Amongst those doing well this week were Danny Doherty, from Denny, with 5 for 18lb 4oz including a 5lb 4oz rainbow, a Gold and a Blue, plus 2 released; Robert Chapman, Linlithgow, 4 for 12lb 12oz; Davy Quinn, Dunfermline, 4 for 12lb including a gold, plus 6 released including a brown estimated at 7lb; Robert Anderson, Longriggend, 4 for 10lb 8oz including 2 golds and a blue, plus 7 released; Alan Armstrong, Dollar, 3 for 10lb 4oz; Kris Elliot, Stirling, 3 for 10lb 4oz; Robert Smith, Falkirk, 3 for 10lb, plus 4 released; Alec Knox, Glasgow, 3 for 10lb including a 4lb 8oz rainbow; Kyle Crossan, Stirling, 3 for 8lb 12oz; Ian Whitelaw, Dunipace, 3 for 8lb; Frank Barr, Falkirk, 3 for 8lb; Rab Cooper, Dunfermline, 3 for 6lb from the small ponds plus 2 browns returned to the Millpond; Charlie Conlan, Glasgow, 2 for 8lb 8oz including a 4lb 12oz Rainbow plus 1 released; Jim Donnelly, Alloa, 2 for 7lb plus 2 released; John Sneddon, Falkirk, 2 for 6llb; Nan Morrison, Stirling, a 4lb 10oz rainbow; Malcolm Miller, Clackmannan, 4lb 12oz gold; Neil Sharp, Dollar, 4lb 4oz gold; Paul Dancer, Whitburn, caught and released 15; Darren Haxton, Cardenden, caught and released 7; Mark Anderson, caught and released 7; Brian Laird, Stirling, caught and released 6; Paul McKenna caught and released 9 in two visits.